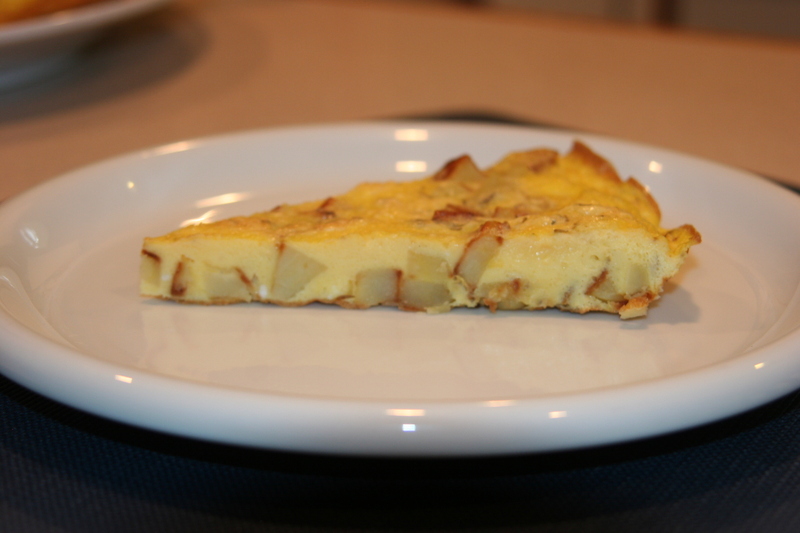 On the weekend, especially Saturday morning, I love making a frittata dish with eggs for breakfast. We have several times tried and enjoyed our famous by now spinach frittata -famous because most of the people we know have tried it at this point. I was looking for an alternative to this favorite dish and ran into tastefull’s omelette with potatoes. I tried it and voila! I think it came out a little dry. I’ll write to Vicky and see if she has any ideas for making it juicier, other than cooking it for less time than I did. Definitely a repeat, though. I’m sure I’ll bring it to where it needs to be next time. How to make: Peel, wash, dry, and cut the potatoes in small cubes. Saute the cubes in a big, hot, oiled pan making sure that they are not crowded. Do not stir yet. When they look soft, stir carefully to get them cooked on the other side for just a few more minutes. Beat the eggs well in a bowl and add salt, pepper, thyme or oregano. Add the eggs to the potatoes. Reduce the fire and let the eggs cook. When the eggs are cooked at the point that you can use a spatula to detach the egg from the edges of the pan, take them off fire and put them under the grill for a few minutes until the top part sets. Ready! You are the sweetest! I have to send Vicky your comment.